This coming Monday night we're headed to Lewisburg, PA to meetup with Two Past Midnight from Bucknell University, our next hosts for "Aca Live." The group is an eclectic bunch that's committed to performing some of the best music you're bound to find in the Northeast. Two Past Midnight doesn't take chances with simple, cookie-cutter type arrangements you can easily find anywhere. No, they're about making sure that their audiences are enjoying the musical experience as much as they are, and that only comes from innovative and exciting arrangements. See Two Past Midnight perform live on "Aca Live" this Monday night, March 27th at 8 PM/ET on our Facebook Page. Till then, get to know the group in the below interview. Our group just turned twenty-one years old! 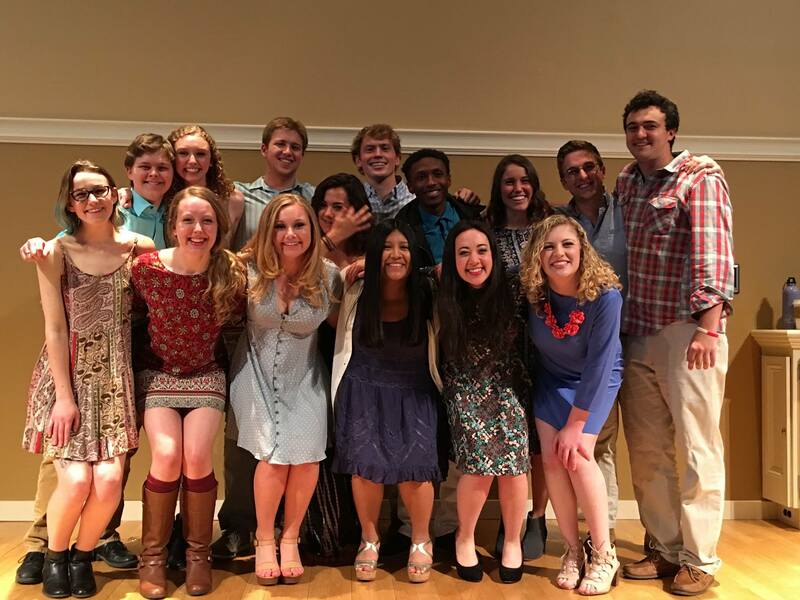 Two Past Midnight was the first co-ed a cappella group founded at Bucknell. A few members of the all-female group on campus decided that they wanted to start an a cappella group with both men and women, and Two Past Midnight was born. The name came from the number of members in the original group: 14, or two past midnight. One of the really cool things about our group is that we all come from very different musical backgrounds, with a huge range of tastes in music. Since we arrange all of our own songs, and currently have multiple arrangers in the group, we have been able to incorporate many different styles into our performances. In general, we look for songs that we can truly make our own. Right now, our set-list currently consists of popular hits, some “hipster” songs, a few oldies and throwbacks, and what we like to call “bangers” – songs that hype up a crowd. 3. Two Past Midnight currently shares the Bucknell University campus with various other a cappella groups. How does the group differentiate itself from these other groups? What makes the group so special? All of the a cappella groups here are talented, so it has always been important to us to find ways to stand out, both musically and performance-wise. We take considerable pride in our arrangements; one of our arranging mottos is that there must be a reason someone would listen to our cover of a song over the original. When we arrange, we are constantly looking for innovative things to do with a song, whether that’s changing the style, like in our jazz- and gospel-influenced cover of George Michael’s “Faith;” weaving pieces of another song into it, like in our cover of Walk The Moon’s “Portugal;” or finding other ways to subvert audience expectations in an arrangement. We also set ourselves apart by really focusing on the performance aspect of our sets. We want our audience to have as much fun as we are, and we spend a lot of time making sure that we bring energy and an element of fun to all of our concerts! We are in the process of recording a new album! It will hopefully be out within the year, so stay tuned. 5. At the end of last year, Two Past Midnight was selected as the winners of the band Joseph's "#Acappellajo" contest. Firstly, congrats! Secondly, can you tell us about the whole experience? Have you had contact with the band, what's the prize for winning and what did you find most fun about the experience? #Acappellajo was an insane experience! We found out about the contest, which was to arrange and record a song from The Band Joseph’s new album for a chance to win a cash prize and a meet-and-greet with the band at one of their concerts, from the band’s Instagram page. From there, one of our members, Alex “Goldie” Golden, arranged “Honest,” and we recorded it in one session, with senior Courtney Buckworth soloing. It was an incredibly fun process, but we never expected to win, which was why we all freaked out when The Band Joseph announced the news. We’ve been in contact with them, and they’re incredibly kind! We put the money towards recording our album, and we’re figuring out when we’re available to go see them in concert. 6. What are some things that Two Past Midnight likes to do outside of music that contributes to your musicality? A few of us are involved in theatre and dance here at Bucknell, which has definitely influenced how we perform our songs onstage; we are looking not only at how we sing, but also how we move, and the emotions required to successfully deliver each song. We also call ourselves the most athletic a cappella group on campus: two of our members are on the varsity track team, a bunch of us go to spin class together every week, and Jon Leung likes to ball on the basketball court. We’re not sure how that affects our musicality, other than we’ve built up the stamina to dance it up onstage and still be able to sing at the same time. Since Bucknell is a relatively small campus, we’ve made a pretty huge effort in the past year to increase our exposure on the college a cappella scene, and we’re so grateful to College A Cappella for helping us do that with Aca-Live. We’re always careful in scheduling our concerts, so that we don’t conflict with another performance on campus, and we’ve been fortunate to have strong attendance at recent concerts – we sold out our last one! We’ve been talking about working in some jazz standards into our arrangements. We often bring in groups from other schools to perform with us at our concerts, since it’s a fun way to get to know the a cappella scene at other schools and make new friends, but we’re starting to look into potentially touring for a long weekend next year and performing at other schools! We had a proposal at our twentieth anniversary concert! All of our alumni came back to perform with us, and we were all onstage for our traditional closer, “In the Still of the Night.” There’s a moment in the song where Two Past Midnight’s president typically gives a speech while we all “shoo-wop” underneath him. This time, however, he handed the microphone to one of our alum’s boyfriends, who was in the audience, and who proceeded to get down on one knee. The audience went nuts, as did we, as you can see from this video! We then got to sing at their wedding later that year. 10. When you consider the fact that you are one of many groups at Bucknell University, what is it like trying to convince new talent to join Two Past Midnight versus another campus group? During New Student Orientation every year, there’s an event where all of Bucknell’s a cappella groups perform a couple songs each for the incoming first-year class. This is a huge selling point for Two Past Midnight, as we work hard to deliver a high-energy set to get potential new members pumped to audition for us – a bunch of students who auditioned for us this year told us they were swayed by our performances and by how much fun we were having up there! During auditions, we do our best to create a relaxed environment, and also spend time chatting with each person after they sing, asking silly questions and allowing them to get to know us as people instead of just as musicians. 12. Lastly, could you give us some background on the below photo from your Instagram? What was the event, how'd you get involved, what was memorable about it, etc.? One unique thing about our group is that we have spirit animals! It’s a huge tradition and a year-long process for new members to receive their spirit animals – the current members deliberate and debate for months before bestowing them at the end of the year, and they’re always so accurate. We also love singing in stairwells – check out our “Stairwell Sessions” playlist on YouTube! For this stairwell session of “Greedy” by Ariana Grande, since we were releasing it on Halloween, we dressed up as our spirit animals for the video. For more information on Two Past Midnight, connect with them on their website, Facebook, Twitter, YouTube and Instagram.